Congratulations to the 2018-2020 Officers of Richmond Bonsai Society! I’m excited about the upcoming year for the club and new prospects for RBS. As President, I want my term to focus on helping to promote knowledge and interest in growing healthy bonsai while supporting proper bonsai techniques and habits. In support of my mission, I want to bring quality programs to you by drawing on in-house talent as well as internationally recognized artists. In an effort to enhance my mission, I want to put a mentoring program in place for any member wanting to expand their knowledge of bonsai. Being a part of a mentoring program, allows you to resolve bonsai related issues and techniques prior to having unfortunate consequences for your trees. We all know that the internet is full of information. There are forums and blogs, Facebook groups, Twitter and Instragram, all related to the bonsai. The styling of bonsai, horticulture and guidelines. In fact, there are charts available to assist us in almost every aspect of our hobby. Yet we have to make the initial selection, appropriate styles for the various species, soil mixes, pot choices and table or stands considerations when displaying our bonsai. All these decisions should be considered collectively towards the desired effect, as all these choices are interrelated and dependent on previous decisions. Yet, a lot of us are still struggling with our trees to have them look like bonsai. Trying to get the soil mix right for this tree, the branches to grow and stay where we want them to throughout the seasons, the right light for optimal and desired growth, the “best” fertilizer, when to water and then to find the pot to highlight or complement a feature of the bonsai. Mentoring is a way to help you weave through all the decisions needed to grow a healthy and beautiful tree. I look forward to bringing this program to the members and to a productive 2018. 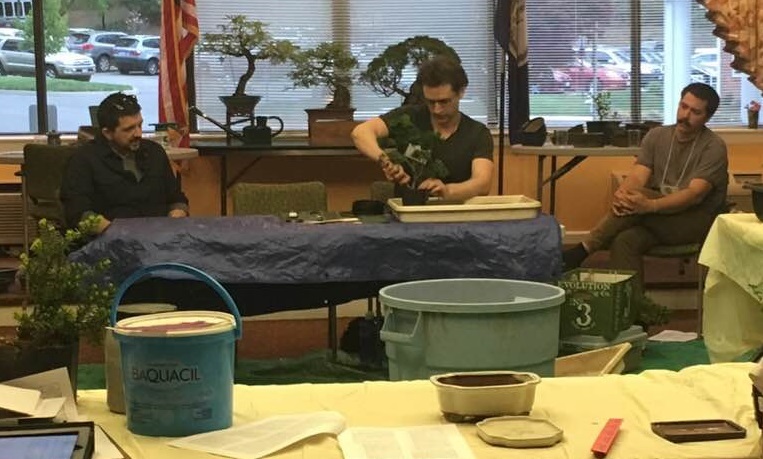 The Potomac Bonsai Association (member through RBS) has ongoing study groups led by Owen Reich and Jack Sustic. If you are interested in taking advantage of one of these study groups, contact LeAnn Duling, PBA President, at ellaroo2@gmail.com. 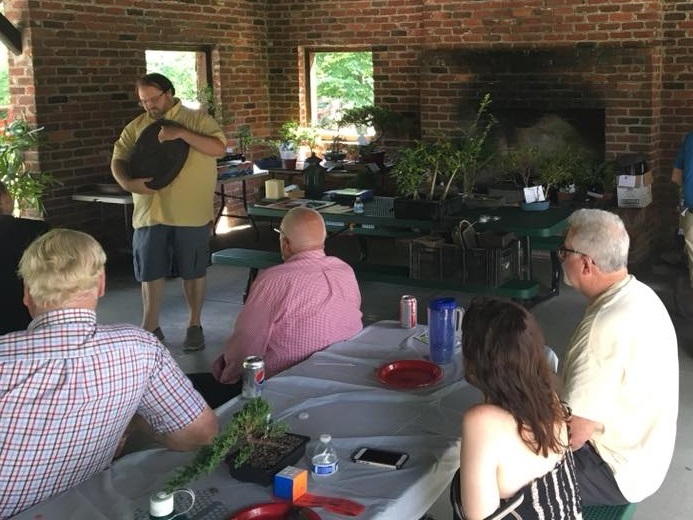 Member Russel Johnson shared some research and demonstrated repotting, after which members worked on repotting their own trees. RBS had a display and info table for the first time at this event. We met a lot of great people and sold some starter junipers. 5 members worked closely with Mauro to wire and style some amazing trees. It was a lot of fun. We all got a but more practice in with correct wiring techniques. May 20 RBS Picnic, Auction, and officer Election. We had a great meal, great fellowship. and a GREAT auction. Thanks to everyone who made it happen, Jack, Randi, Ron, Pat, Thomas and everyone else! Congratulations to the 2018-2020 Officers And Board of Directrors of Richmond Bonsai Society! *We are all very grateful for the service of the board members and officers of the past two years, including Jack, John, and Ron. For personal reasons, Ron has asked to be relieved of serving on the board as Past-President, so Thomas has agreed to continue to serve in that position. Join RBS and our Sister Clubs in the Potomac Bonsai Association us for our annual bonsai festival which features something for everyone. Activities include workshops, demonstrations, special exhibits, and vendors. Members can enter trees in the Member Bonsai Show. Please contact Thomas if you are interested. The festival is at the National Bonsai & Penjing Museum, Washington, D.C. In addition, PBA is looking for Volunteers. Volunteer Sign-Up is on the RBS Website Event page. June 18 RBS Board Dinner and Meeting, 6 pm. The new and the old boards will meet to plan activities and discuss other club business. All members are welcome to attend. We will meet at Jason’s Deli at 7115 Forest Hill Ave. If you wish to have dinner, please come at 6 pm (dutch treat) and the business meeting will start at 7 pm. 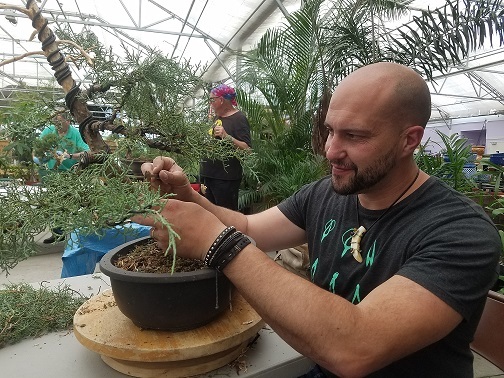 RBS is happy to welcome guest teacher Tyler Sherod will talking about good bonsai growing and development practices at different tree stages. He will bring a few trees to show and demonstrate with. This meeting will take place in the Community Room of St. Mary’s Woods at 7 pm. If you have trees that you want help or advice on, please come early. Bio: Tyler was born in Hickory, North Carolina. He attended the University of Tennessee at Knoxville, majoring in philosophy with a minor in cinema studies. After graduating, he was introduced to bonsai when he worked at the Bonsai Learning Center in Charlotte, North Carolina. After working at there for a year he attended several workshops with Boon Manakitivipart of Bonsai Boone in the Bay area of California. Boon assisted Tyler in gaining an apprenticeship with Sinji Suzuki in Obuse, Japan beginning in 2011, lasting five years. In the spring of 2016 Tyler received his professional certification from the Nippon Bonsai Association. 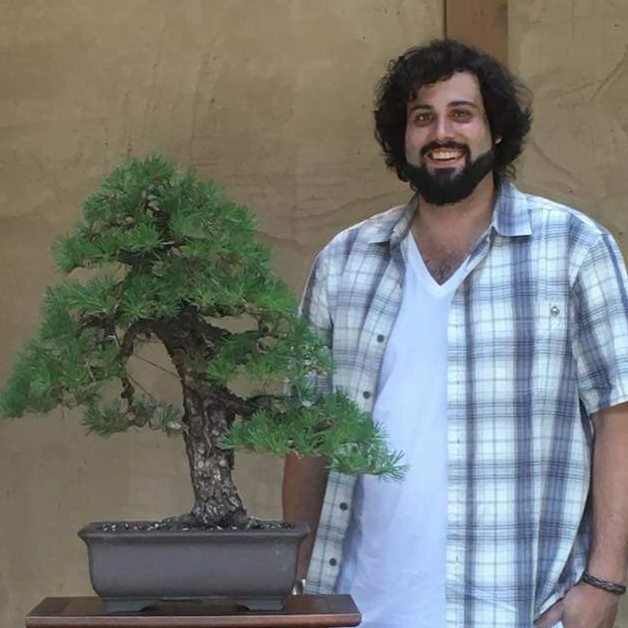 While working under Mr. Suzuki, Tyler refined and prepared trees to be entered in Japan’s top bonsai competitions which included Kokufu-ten, Taikan-ten and Sakafu-Ten, where several of the trees won top prizes. Tyler returned to North Carolina in June, 2016 and established Dogwood Studios. Tyler’s goal is to elevate the level of bonsai in America. He wants to celebrate the vast landscape of America and celebrate it by capturing the emotions of the changing landscape through Bonsai. Ask five people which bonsai soil mix they use and depending on who they “studied” with, or which website they frequent or even who they asked “last,” the answers will be as diverse as asking them which style of BBQ they prefer. Asking someone the ingredients of their soil is the wrong question…you should instead, ask to see their trees. If their trees are (1) strong – indicating good basic horticultural practice, (2) have good ramification – indicating strong budding and root growth, then you should be very interested in their soil mix. Focusing on the horticulture of bonsai, remember that good trees share several aspects including well-draining bonsai soil and a plan for fertilization. A well-draining soil mix contains the proper percentage of water retentive soil particles, as well particles that provide for quick drainage yet also supports a medium for the exchange of oxygen. Starting with a well-draining bonsai soil is the first step you should take to ensure your material achieves its potential. A proven bonsai mix used throughout the bonsai communities is a mix containing varying percentages of pumice, akadama and lava. The percentages vary depending on the species of tree. Although every tree’s water requirements are different, a rule of thumb is that deciduous require more moisture therefore more akadama is added to the soil mix where conifers require less moisture, and therefore more pumice is needed for a conifer soil mix. Regardless of the soil mix you decide upon, there is one key element you need to address. When purchasing nursery stock from a landscape nursery or the RBS bonsai auction, or the internet or a Facebook auction, take the time to check the soil of your tree and plan to repot during the appropriate season to ensure that there is no native soil, or pine bark mix or other non-bonsai soil mix trapped in the center of the rootball. The properties of the non-bonsai soil create an area where moisture is retained as opposed to the free draining properties of bonsai soil. This situation promotes root rot, weakens the tree and causes eventual death of the tree. If you buy nursery stock for your bonsai from any landscape nursery, remember to ALWAYS change the growing medium of the material BEFORE you start to style it. In order to give your bonsai material the best start to becoming a bonsai, first establish the tree in bonsai soil. Use the time the tree is acclimating to bonsai soil to study the structure, evaluate your options and sketch out your development plans for your new tree. Evaluating your tree over time often leads to several options. Following these basic and simple rules will give your tree a strong start and also give you time to think through all the options and evaluate your plans for your newest acquisition.